If you're looking for a great temporary way to display photos, posters, artwork, and other papers, Scotch Removable Clear Mounting Squares are the way to go. They give you the option to move, remove, and rearrange images without damaging walls or the materials you're displaying. 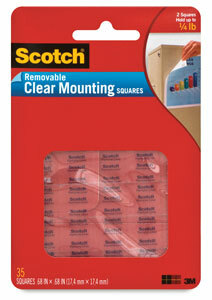 Scotch Removable Clear Mounting Squares are pre-cut squares of clear removable adhesive that can be applied to virtually any clean, dry, smooth surface including walls, office cabinets, refrigerators, and windows. They are photo-safe and won't stain walls like mounting putties can do. Each package includes 35 double-sided adhesive squares measuring 11/16" × 11/16" (1.75 cm × 1.75 cm). Two squares hold up to 1/4 lb (113 g).